Amazon.com description: Product Description: Continuing his exploration of the organization of complexity and the science of design, this new edition of Herbert Simon's classic work on artificial intelligence adds a chapter that sorts out the current themes and toolsâchaos, adaptive systems, genetic algorithmsâfor analyzing complexity and complex systems. There are updates throughout the book as well. These take into account important advances in cognitive psychology and the science of design while confirming and extending the book's basic thesis: that a physical symbol system has the necessary and sufficient means for intelligent action. The chapter "Economic Reality" has also been revised to reflect a change in emphasis in Simon's thinking about the respective roles of organizations and markets in economic systems. 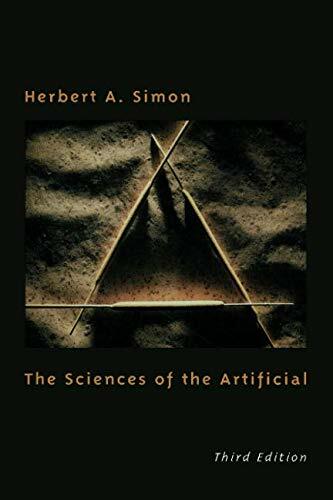 About: Continuing his exploration of the organization of complexity and the science of design, this new edition of Herbert Simon's classic work on artificial intelligence adds a chapter that sorts out the current themes and tools -- chaos, adaptive systems, genetic algorithms -- for analyzing complexity and complex systems. About: Now highly expanded in length and in the sweep of its intellectual designâthe range of its consideration of social and economic systems has been extended and there is new material on human psychologyâthis book has been highly regarded and widely referenced since its publication in 1969. About: Continuing his exploration of the organization of complexity and the science of design, this new edition of Herbert Simon's classic work on artificial intelligence adds a chapter that sorts out the current themes and tools―chaos, adaptive systems, genetic algorithms―for analyzing complexity and complex systems. About: The Sciences of the Artificial reveals the design of an intellectual structure aimed at accommodating those empirical phenomena that are "artificial" rather than "natural.